Convento dos Capuchos to Monserrate – Hiker Ph.D.
We’re in Portugal for a few weeks visiting family and I thought it might be fun to look into hiking here. Like much of Southern Europe, the concept of recreational walking is thought to be more than a little odd. Walking for fun? 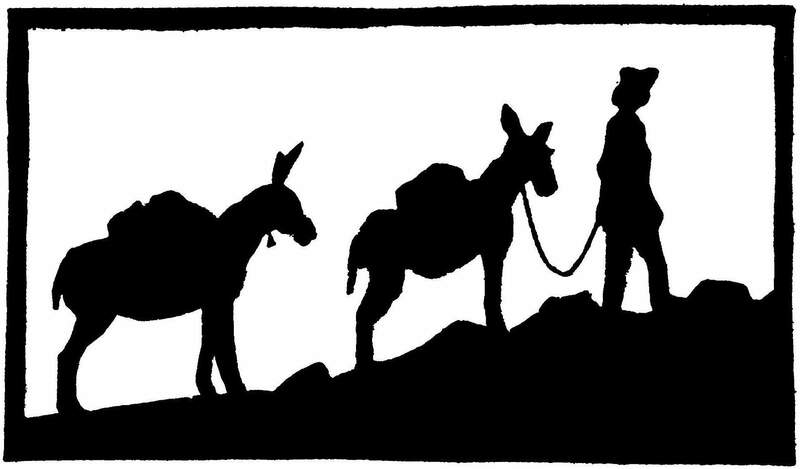 This mentality is slowly changing however and the country now boasts at least one long-distance trail. Still, there is no comprehensive hiking guidebook for the country and only after a careful search was I able to find an out-of-print book by the small Cornwall based Pili-Pala Press entitled Walking in Portugal (2nd ed. 2000). As my partner’s family lives near the coastal town of Cascais, just a short drive from the picturesque Sintra region, we decided to give their Sintra walk a try. This walk begins in the town of Colares on the N247, the main road through Sintra to the coast, but it quickly leaves tarmac behind and ascends into the lush greenery for which Sintra is so well known. Through cascading flowers, cork groves, and aromatic eucalyptus, the path winds among ruined villas, magnificent old quintas, and sleepy mountain villages. The Convento dos Capuchos resembles something out of a fairy tale and is worth a visit whether or not you choose to show up on foot. Founded in 1560 by Franciscan monks, the devout inhabitants had a clear-eyed ecological sensibility and the structure seems to rise organically out of the earth. Frivolous ornamentation is completely absent and the rooms are impossibly small, almost as if a colony of hobbits or some other diminutive creatures might have once inhabited the tiny cork-lined cells. The walk from the convent to Monserrate is rather more confusing as it passes through a matrix of forestry roads—some active, others not so much. I’ve done my best to indicate the route below, but I mainly relied on intuition. We didn’t have the energy to explore Monserrate and instead pushed on to complete the loop, but I’ve heard great things about the 18th century English garden. The town of Gigueirós is a particularly idyllic spot with bougainvillea-lined stone walls and beautiful views across the valley. There’s something nice about taking a break from wilderness hikes to undertake a lazy walk on old village paths. Barring a few aggressive dogs and their aloof owners (a good reason to carry a walking stick), it was a wonderful day. 0.0 miles: Begin walking south along Rua José Franco da Costa at the intersection of the N247 and the N375 in Colares. 0.1 miles: Pass a church to the right, the Capela da Misericórdia de Colares ou Antiga Capela da Família Melo e Castro, then continue past the square as the road becomes first Rua da República and then Rua Dezasseis de Infantaria. 0.25 miles: Turn left at the Rua das Flores, a small road that quickly becomes a dirt path. 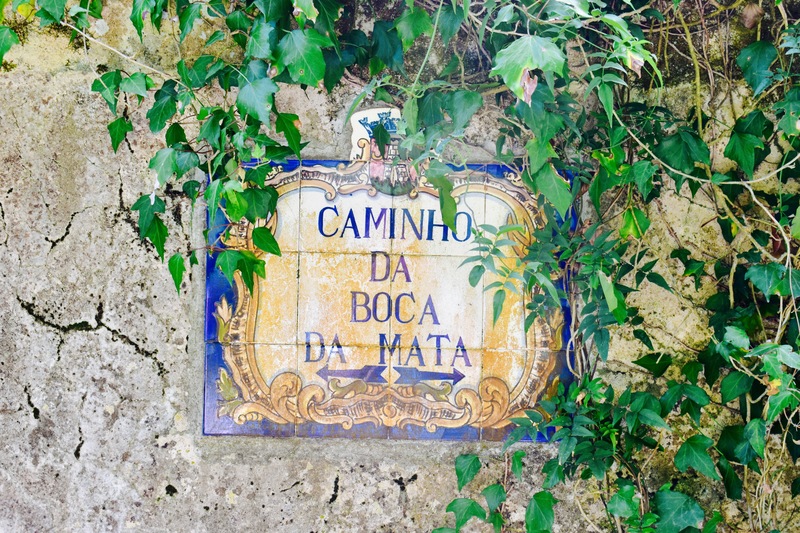 0.7 miles: Take a left at a T-junction marked with an azulejo tile sign as Caminho Boca da Mata. Shortly afterward, note a fork running off the left signposted Caminho do Rio Velho. This will be your return route (see mile 6.12), so ignore it for now and continue straight ahead. There was an enormous pile of manure for sale at the fork when I came through. Ongoing deforestation in this stretch might be confusing, so just ignore any small roads and paths and stick to the main track. Shortly after crossing the valley, take a right turn uphill so that you are almost doubling back on yourself. Unfortunately, there are no signs to the convent, but you should eventually pass a small reservoir on the left. Charming azulejo tiles mark your route. 1.8 miles: Pass straight through a series of forestry roads. 2.0 miles: Pass a gate at the Convento dos Capuchos picnic area. The complex used to be accessible here. No longer. To tour the convent, you must continue to the main entrance. 2.17 miles: Turn right at the junction for a short walk to the main entrance to the convent. A large stone wall should be on your left and you will pass a spring (convenient for refilling water). 2.35 miles: Arrive at the Convento dos Capuchos. When you’ve finished at the convent, continue to Monserrate by retracing your steps with the stone wall now on your right and staying straight at the junction. Pathfinding in this section can get tricky very quickly because of all the crisscrossing roads. At one time, there were white blazes marking the road to Monserrate, but forestry seems to have obliterated these guides. 2.67 miles: Pass a white building to the left as the trail slopes downhill. 2.75 miles: Keep right at the fork in the road. Stay on the main track, ignoring side roads. 3.0 miles: Pass a pond on the right, the Lagoa dos Mosqueiros (Mosques Lagoon). A path from the right intersects with the trail but stick to the main path. Soon after, ignore a couple of roads heading left. Note: If you have a copy of Walking in Portugal, bear in mind that my path through the woods at this point between the convent and Monserrate deviates slightly because the dirt roads seem to have changed in the last 17 years. 3.4 miles: Arrive at a three-pronged fork and take the center path, which quickly becomes a cobblestone road. Follow this road downhill past a couple of ponds and several interactive signs with information about the local ecology. There is a small parking area and you may encounter some tourists before passing a green gate and arriving at the N375. 3.72 miles: Take a right at the Rua Barbosa do Bocage (N375) and walk a short distance to the main entrance of Monserrate. When you are finished at Monserrate, walk back along the road (stay alert for cars!) and continue past the point where you emerged a short while ago. 4.24 miles: Pass the gate to a large estate named Quinta da Capela. 4.32 miles: Just before passing a house on the road (part of the Quinta da Capela) take the dirt road heading uphill to the left. 4.43 miles: Stay right at the fork. The left is marked Proprieda da Privado (private property). Keep to the right after passing an old reservoir. 5.0 miles: Emerge from the forest before a wooden gate and turn right into the small village of Gigueirós along the Caminho de Rio de Milho. 5.17 miles: Take at left the intersection and continue through town. Once you leave the town, the tarmac road becomes dirt once more. 5.5 miles: Pass the gated entrance to the magnificent Quinta do Carmo. The trail hugs the perimeter wall of this converted convent and offers views across the Quinta’s citrus orchards and gardens to Colares beyond. 6.0 miles: Follow the azulejo tile sign indicating the Caminho do Rio Velho. The path becomes cobblestone, passes a few houses, and crosses a stream. 6.12 miles: Keep right at the intersection with Caminho da Boca da Mata (see mile 0.7) and keep right again at the azulejo a short while later to return to Colares. 6.6 miles: Arrive back in Colares and retrace your steps another quarter mile through town to the N247. Click to view the waypoints in Google Maps. Ⓐ Hiked by the author, July 14, 2017.